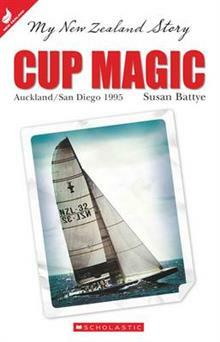 "Fictionalised diary of Mike Lucas whose parents are involved in Team New Zealand's 1995 America's Cup challenge in San Diego, where Peter Blake's Black Magic boat wins the cup. Mike is sent to live with his grandparents in Takapuna, where he learns to sail, and eventually he tra... read full description below. Mike Lucas wants to know why he's being sent to live with his grandparents. There's some big secret that no one's telling him. At least Poppa is teaching him and his mate Hone to sail. But then Mike learns the reason for the secrecy: his parents are working with the Team New Zealand boat builders for the 1995 America's Cup challenge. And then he finds out that the whole family is going to San Diego! Everyone is wearing their lucky red socks and excitement is feverish ... can Black Magic bring home the Cup? My NZ Story: Cup Magic by Susan Battye. Scholastic, 2013. The latest title in Scholastics's My New Zealand Story series, this fictionalised tale is based on the America's Cup campaign of 1995. The diary is written by 11-year-old Mike, whose parents work for the Team New Zealand. We meet Mike when he is upset and unsure of the reason he is living with his grandparents. He hardly ever sees his parents and fears a family break-up. Eventually, he learns that the mystery is because of their all-consuming work for Team New Zealand. He becomes more involved with what is going on and learns to sail. Finally he is able to travel to travel with his Mum and Dad for the campaign in San Diego. The excitement and emotion of this extraordinary time in our sporting history comes to life through Mike's experience. Herald on Sunday. June 9 2013. Living, Sunday Books pg. 23. The high standards made by this series are maintained in this insightful look at the America's Cup at San Diego in 1995 in which the immortal words "the America's Cup is now New Zealand's Cup" were spoken on air by Peter Montgomery. It wasn't that easy though. The story of that campaign is told through the eyes of 12 year old Mike Lucas whose parents were behind the scene making the sails for NZ 32 and NZ 38. All the skullduggery and subterfuge that have been the hallmark of the America's Cup regatta are exposed here, particularly when a journalist after watching part of the race by Black Magic against the previous NZ contender NZ 20, called the NZ boat a dog with no chance. All team members of this campaign are given a mention particular Christchurch woman Leslie Egnot who all but beat Dennis Connor with an all women crew. The Red sock campaign to buy Team NZ another sail is highlighted and the fact that Sir Peter Blake was an avid Scrabble fan. Told in diary form it covers all the races in the Louis Vuitton Cup and the 5-0 thrashing of Dennis Conner in the final. Primary/intermediate in appeal but everybody will get something from this novel about a great chapter in NZ sporting life. Susan Battye began writing plays for the students she taught at Greymouth High School because she could find nothing to direct that came close to fitting the curriculum requirements. Some of these plays have formed the basis for her books, as with her first book for Scholastic, written in conjunction with fellow teacher Thelma Eakin: My Story: The Mine's Afire! about the Brunner Mine disaster.